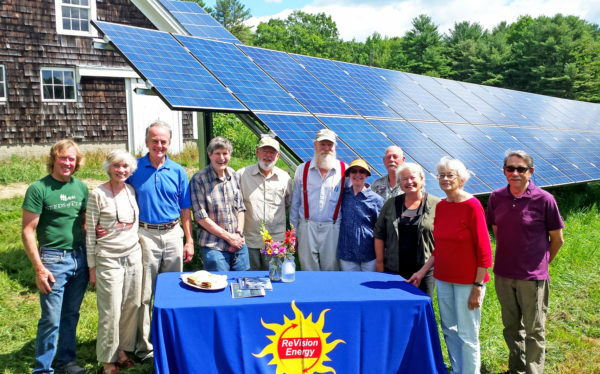 The member-owners of this solar farm in Edgecomb, Maine, celebrate their community solar project! Community solar farms (CSFs, or, solar gardens) make going solar possible for those who want clean energy but don’t have the ability to put it on their own roof (or on the ground in their own yard). ReVision Energy provides an ownership model of community solar, meaning, each participant in one of our solar farms actually owns a share of solar in one of the community projects. This is in contrast to models of community solar that are investor-owned, where the solar customers change over time and do not have a stake in the actual solar generation asset. A great advantage of the solar farm is that the share is portable – if you sell your house (and move to another home within the region of the same utility company) or if you move to another apartment, your community solar share comes with you. 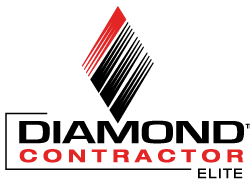 If you need to move out of your utility’s service territory you can sell your share to another person. Unlike leasing, or purchasing electricity from a competitive energy provider, you actually own the share of the solar project. This means you have access to all the same financial incentives as someone who purchases solar and puts it on their own roof, including affordable financing. Simply put, solar farms are a way to bring solar to the great number of people who do not own their home, own a home that is unsuitable for solar, or have maximized the solar potential at their existing home and want to generate more solar electricity. 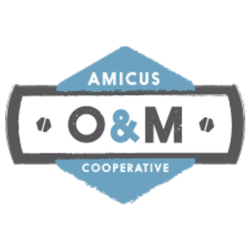 It also is a cooperative model that puts energy production into the hands of a small group of people and decentralizes the energy grid. CSF is located in a location with ideal, unobstructed solar access. The solar array is optimized for maximum production year-round. 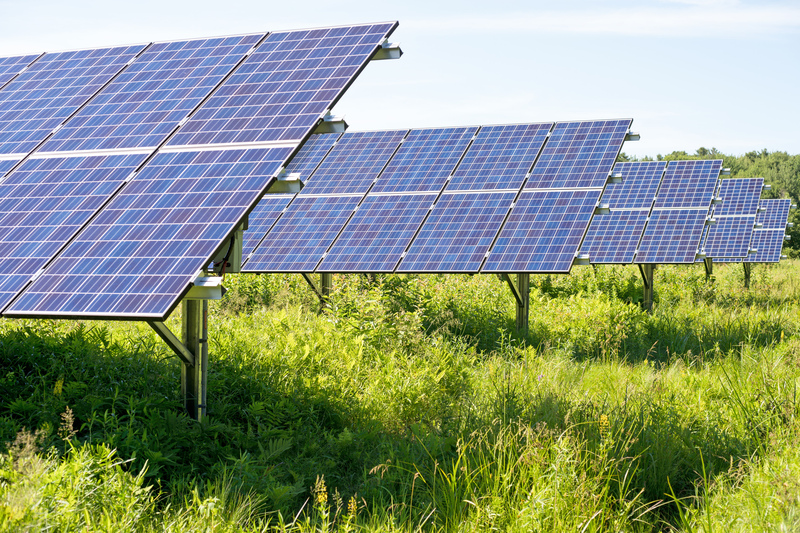 Generally, the CSF project is a fixed ground-mounted solar array which may be attached to the ground in one of a number of different ways depending on site conditions. All electricity generated by the community solar array feeds to the grid, where it powers the local utility grid. The power generated is tracked by the utility and reconciled monthly. Unlike an on-site solar electric system, where some of your solar energy is consumed ‘behind the meter,’ 100% of the electricity from the community solar array is banked with the utility. Through virtual net metering, your share of the community solar farm’s production is automatically applied to your bill. So for instance, say a farm generates 10,000 kilowatt-hours in a month, and you have a 10% share. You will automatically receive a credit of 1,000 kilowatt-hours on your electric bill. Sky Ranch Community Solar Farm, Wayne, ME. Seawall Boat Storage Community Solar Farm, Southwest Harbor, ME. Crystal Spring Farm Community Solar Farm, Brunswick, ME. Morris Farm Community Solar Farm, Wiscasset, ME. Maine Idyll Motor Court Community Solar Farm, Freeport, ME. 3 Level Farm Community Solar Farm, South China, ME. Edgecomb Community Solar Farm, Damariscotta, ME. Midcoast Friends Community Solar Farm, Damariscotta, ME. White Duck Community Solar Farm, Waldoboro, ME. Higgins Corner Community Solar Farm, Lisbon Falls, ME. Bob’s Clam Hut Community Solar Farm, Hollis, ME. Will a Community Solar Farm Work For Me?